addition to the existing printing equipment. The main advantage of on-demand printing are: 1. Short time between order intake and actual production start (no need for printing tools) 2. Short equipment set-up time 3. No product waste 4. Short production runs 5. Excellent colour to colour register But there are also disadvantages: 1. The high ink cost 2. The limitation in production speed 3. The limitation on substrates that can be printed. Resulting in the need for pre-coating or the use of drying/curing equipment All this asks for an in-depth evaluation of your customers and production capabilities before you start selecting and investing in on-demand printing equipment. 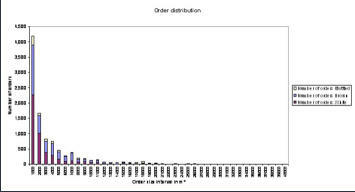 The evaluation can start with analysing your order run length distribution which can look as presented in the graph. Key is that you see it as an add on and not as a replacement for your current equipment. Technology Coaching can help you making the right decisions related to on-demand printing by: 1. Analysing your order history as a starting point for making future decisions 2. Testing the capabilities of on-demand printing on the market 3. Including the options of using on-demand conversion equipment for making boxes Please contact Technology Coaching if you want more information or a quotation.